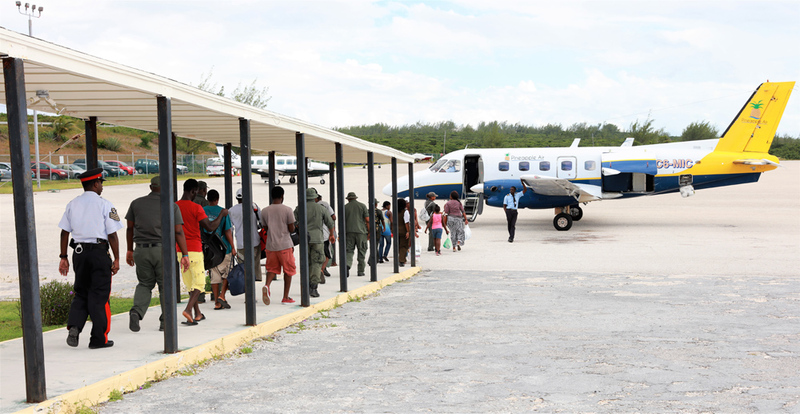 Ten individuals were flown into New Providence on Thursday afternoon, November 16th, 2017, after being taken into custody during a joint Immigration and Police operation on Wednesday, November 15th, which targeted illegals across mainland Eleuthera. (Eleuthera, The Bahamas) Immigration teams in Eleuthera in cooperation with the Eleuthera Division of the Royal Bahamas Police Force (RBPF), conducted an island-wide operation on Wednesday, November 15th, 2017, dubbed ‘Operation Rush’, as a precautionary measure, following the recent illegal sloop landing in the southwest area of New Providence, which occurred sometime between Saturday night, November 11th, and Sunday morning, November 12th, 2017, near the Defence Force base located in Coral Harbour. As a result of the operation, which Chief Immigration Officer in the Eleuthera District, Mrs. Shema Darling, said used every method in their arsenal – including roadblocks and going house to house – ten (10) people were taken into custody and subsequently transported to the Carmichael Road Detention Centre in New Providence on Thursday afternoon, November 16th, where they will be held pending further investigations. ‘Operation Rush’, which began at about 5am, saw Immigration and Police cover areas from Blackwood Village in North Eleuthera to Tarpum Bay in South Eleuthera. Five men, four women, and one female child were among the individuals taken into custody for a variety of immigration offences, including illegal entry, overstaying, working without a work permit, possession of fraudulent documents, an outstanding police warrant, as well as harbouring illegal immigrants. Nine of the immigrants were of Haitian nationality, including a US born minor child, and one of the men was a Jamaican national. During the operation on Wednesday, RBPF Officers, led by Assistant Superintendent Frank Neely, also arrested a man from Lower Bogue, North Eleuthera in reference to possession of dangerous drugs with the intent to supply, after he was found with two packets of suspected marijuana on his person. He was charged with the offense and later released on bail, pending arraignment.